We encourage use of our coatings in restoration, re-roofing and new construction applications where we can confidently provide 5 to 20 years of additional leak-free performance. We seek to install sustainable systems that perform well beyond original warranty periods and that can be renewed by utilizing appropriate reinforcement and recoat approaches. We recognize that roof life extension yields financial returns far above energy savings. The ability to implement & follow National Coatings warranty process. Click here to apply to become a National Coatings Approved Applicator. Product Guarantees – a Product Guarantee states that our product is free of any defects in manufacturing . National Coatings will replace the product when such product proves to be defective in manufacture as determined by National Coatings. 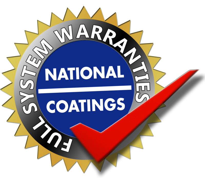 Full System Warranties – a Full-System Warranty states that National Coatings will provide all labor and National Coatings materials necessary to repair a leak as a result of deterioration caused by normal weather conditions. The System usually must include fabric over the entire field or be an SPF Roofing System. All projects to be warranted require that the contractor notify National Coatings in writing by submitting the Warranty Application form. The project must then be approved by National Coatings before proposing a warranty to a building owner and before commencing work. All Full System Warrantees MUST be inspected PRIOR to work starting and approved by National Coatings Corporation’s Technical Representative. National Coatings requires that contractors applying for a Full System (labor and materials) Warranty agree to provide National Coatings with free-of-charge labor needed to address any claims during the years one (1), two (2) and three (3) of the warranty period. National Coatings agrees to provide all materials and labor and the Approved Applicator agrees to perform repairs which may become necessary under the warranty for water leaks occurring in the years four (4) through ten (10). An additional year will be required from the contractor for each additional 5 yrs of warranty over the 10 yrs. All Full System Warranties require payment to National Coatings of a per square foot warranty fee. These warranty fees are $0.10/ft2 for 10-Year Full System Warranty, $.12/ft2 for 15-Year Full System Warranty and $0.15/ft2 for 20-Year Full System Warranty. The minimum square foot charge is 10,000sf. National Coatings requires pre-job, in progress and final inspection. Inspections fees are NOT included in the above warranty fee. Please contact National Coatings for the warranty inspection cost. There is no payment requirement for a Product Guarantee. An Independent Consultant or company field representative will normally inspect all projects involving Full System Labor & Material Warranties. All material used in all warranted systems must be purchased from National Coatings. All materials and fees paid. Final inspection and punch-list verified complete. Final approval of the Warranty Application by National Coatings’ management. The warranty is contingent on being signed by an officer of National Coatings and by an authorized representative of the Building Owner. Original signature of the Building Owner must be delivered to National Coatings within 30 days. Once received, an officer of National Coatings will sign both originals and one will be returned to the building owner. AcryShield SPF Roofing Systems shall be installed to qualify for 10, 15 and 20-Year Warranties. The standard warranty offering for AcryShield SPF Roofing Systems is a 10-Year Full System Warranty (labor and materials), 15-Year and 20-Year Full System Warranties are also offered. All AcryShield SPF Warranties require the application of higher density spray foams that achieve greater than 42 psi compressive strength installed at 1-inch minimum thickness. The AcryPly® Roofing System designation shall be used only for polyester reinforced all-acrylic systems that qualify for a minimum 10-Year Warranty. The standard warranty offering for AcryPly Roofing Systems is a 10-Year Full System Warranty, although a 15-Year Full System and a 20-Year Full System warranty may be offered depending on detail design and coating thickness. The amount of coating needed for warranty qualification depends on the condition of the entire roof and any problem areas. Refer to your custom specification for more detailed information. The AcryPly® Roofing System designation shall be used only for polyester reinforced Emulsion/Acrylic systems that qualify for a minimum 10-Year Warranty. Locally-reinforced coating restoration systems and 1-ply emulsion/acrylic systems may qualify for at least a 10-Year Warranty under the AcryShield Restoration System designation. Since AcryShield Restoration Systems are a key tool for extending the leak-free lives of various roof types, National Coatings strongly encourages owners to sign annual maintenance agreements with our Approved Applicator to monitor an AcryShield Restoration System and to ensure maximum longevity and performance. On a case-by-case basis, National Coatings may offer a Full System Warranty for an AcryShield Restoration System installation. Key factors influencing this decision would include: roof age and physical/chemical condition; roof slope; building design and location; contractor track history installing similar systems; and an owner’s investment in an annual maintenance agreement. The standard warranty offering for Silicone Roofing Systems is a 10-Year Full System Warranty, although a 15-Year Full System and a 20-Year Full System warranty may be offered depending on detail design and coating thickness. At the discretion of National Coatings Corporation, a warranty may be transferred from one building owner to another. A roof inspection is mandatory before the transfer can be completed.